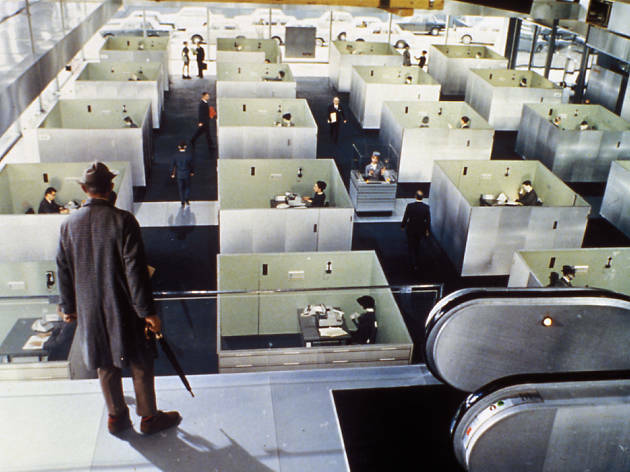 French actor-filmmaker Jacques Tati’s 1967 masterpiece still holds up as a feast of subtle sight gags, playful noise and, above all, visual wonders. Tati’s pipe-smoking alter ego Monsieur Hulot (as seen in ‘Mon Oncle’ and ‘Mr Hulot’s Holiday’) takes a back seat here to the director’s intricate, extraordinary and very expensive reconstruction of a tech-obsessed, futuristic Paris. Tati gives us events more than story as Hulot finds himself mixed up with a coachload of American tourists at the airport, out and about in the city and at the opening of a fancy new restaurant. Classic tourist sights (the Eiffel Tower and Sacré-Coeur) are seen only in brief reflections. 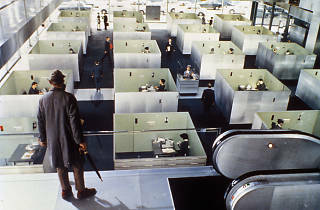 The influence of ‘Playtime’ on filmmakers like Wes Anderson, Roy Andersson, Aki Kaurismäki and even Pedro Almódovar becomes clear as you wonder at the detail of Tati’s unique world. The humour is low-key, although there are some fantastic and beautifully simple jokes along the way. The straight lines and colour schemes, all greys, silvers and blues, only give way to something approaching a more palatable and joyful anarchy as the film comes to a close. Genius.